Now it’s starting to get scary, I can’t believe the time is almost here and there are only 10 days left before we go. This week both Ryan and I had to contend with the difficulty of how to deal with injury. On Tuesday my knee make a horrible unnatural crunching sound whilst at work, which made it very painful to cycle at all. Being this close to the start of the journey to Switzerland it’s hard to know what to do. Obviously with a minor injury it’s important to take some rest time, but how much time? Last week was the last proper week of training as now we’re winding down in preparation for the big day and more training was essential, but to run the risk of making an injury worse and being unable to even start the trip would be crazy! I took some of the week off to rest my knee, but I still got plenty of vital things done instead…like building my new bike so that I actually have something to ride on the trip. A quick recap for those who aren’t aware, my old bike which I’ve been using for years and for all the training so far, is actually too large for me. Although this does not cause many problems day to day, on anything more then a 50 mile ride I have a lot of back pain due to having to stretch too far to reach the handlebars. Before…a perfectly good and reliable bike, just not quite right for me. The finished product. 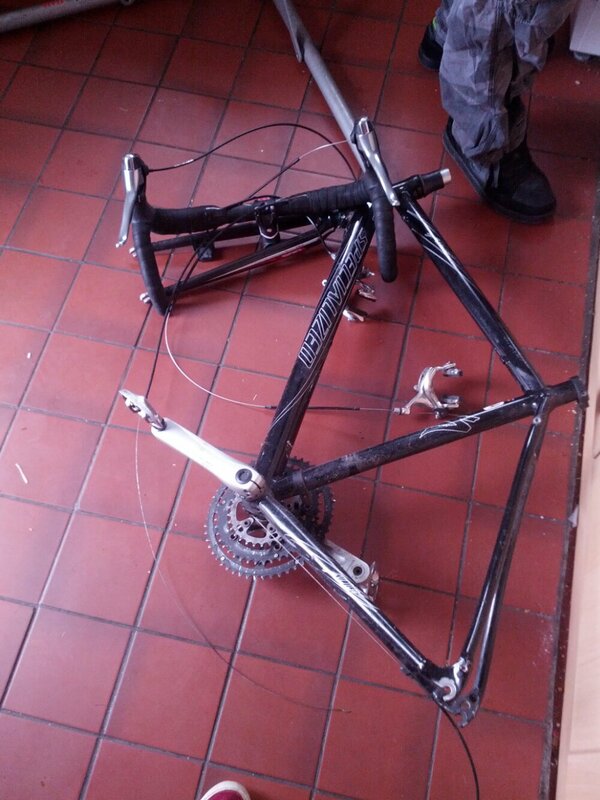 Brand new frame….borrowed everything else. Just an excuse for Ryan to take a photo of his car! I am very happy with the final result and the bike is already a lot more comfortable to ride then the old one. Although I am slowing down the training over the next week I still need to go out and use the bike lots to make sure everything is in working order, so I’ll be getting out a few times this week. The only thing left is to decide on a name for the bike. I’m informed by Ryan that the First Rule of Bike Club is that a bike must have a female name, and you don’t get to name it yourself. 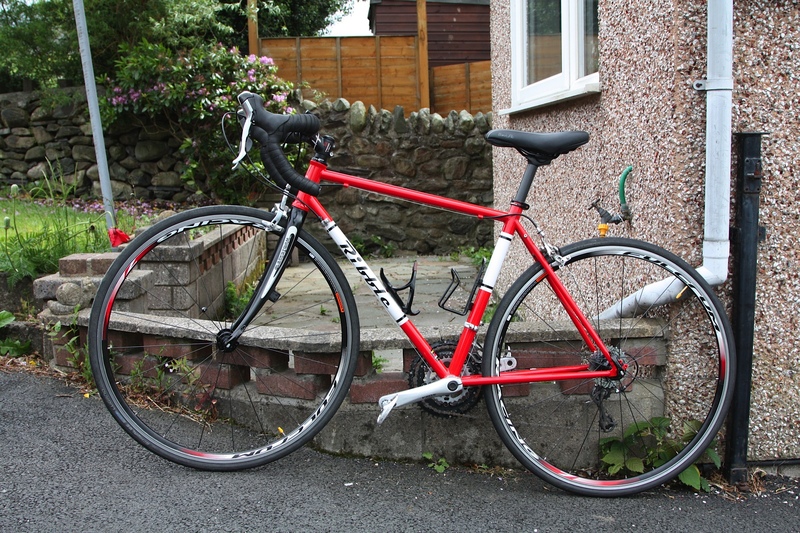 I have reliably informed Ryan that I don’t care about the First Rule of Bike Club, or what he or anyone else calls it, my new bike is called Felipe…. 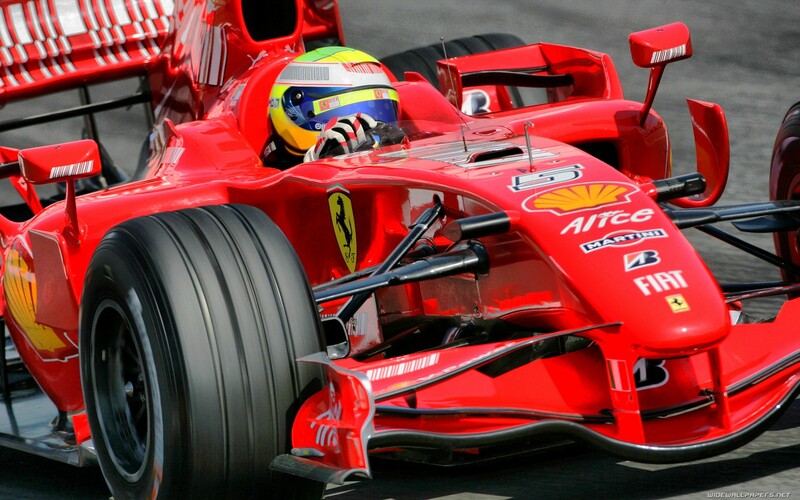 Surely…anyone can see the similarities between my new vehicle and Felipe’s? There’s not a lot to say about rollers really, but today I managed 13 minutes of continuous no-hands stability at the end of an hour and a half session. The other good news is that my back is on the mend, and I should be back outside in a few days. Crimea Pass, Bumble bees and Pecan Pie. I have mixed emotions towards the three elements of this blog title. Take Bumble bees for example, I can cope with them if they bumble on past me about a meter away. They’re better than wasps, worse than flies, but I can cope. I can’t, however, cope with Bumble bees crashing into my face, about 2cm from my mouth, when I’m sailing down a long hill at 30mph. The small bug felt more like a tennis ball. Crimea pass, I can cope with when It’s a Welsh name said in passing conversation when Ryan’s talking me through the route I’m taking that day. Crimea is also an okay word when described in a sentence as “rather pleasant”. I eventually found out that Crimea Pass is actually a pretty substantial hill climb from Betws-y-coed towards Blaenau Ffestiniog. So Saturday after work, my parents and I drove over to North Wales to see my brothers and to enable me and Ryan to get an impromptu Team Pedal training day in on the sunday. When we arrived Ryan had some bad news that he had pulled his back and it was causing him a considerable amount of pain . In the hope that it would be better in the morning we planned a 100 mile route out on the A5 towards Bala and back towards Caernarfon and home again . We talked a bit about the ride, and current training and preparation for our big ride to Switzerland as it is only 2 and a half weeks away now! It was also a great opportunity to have us all in one room discussing the finer details of day to day camping life on the trip; i.e. what kind of meals we’ll be having , what time we aim to be finished cycling for the day and how many euros we’re planning on taking the fund the trip. So all in all a good excuse for a good chin wag. We headed to bed at about midnight and set alarms for 7.45 the next morning , hoping to be out by 9am for a long ride. Sadly , Ryan’s back was no better in the morning, and was in fact a lot stiffer. After he attempted a slow climb onto the bike, he concluded that he couldn’t go out on a ride, and that I would in fact have to go out ALONE. 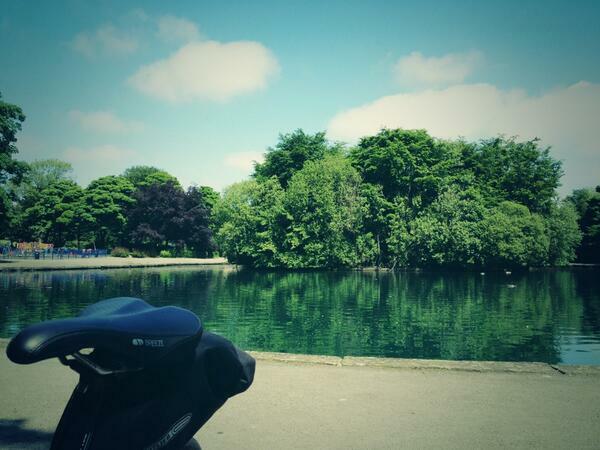 Now, whilst I do enjoy cycling alone, it’s nowhere near as enjoyable as it with Ryan and Jen. Setting off on a long ride, it’s also much more daunting when I’m attempting it alone. I set out on a roughly 80 mile route following the A5 down to Betws-y-coed and then following A roads in a biiiig loop around Snowdon back towards home again. The first leg of the A5 was a little disheartening as it took me a little while to fully warm up, and I had to stop twice to adjust my cleats on my shoes. After a rocky start, I set a good pace of 15-17mph and got stuck in. I have a mini-tradition (as in I’ve now done it twice.) 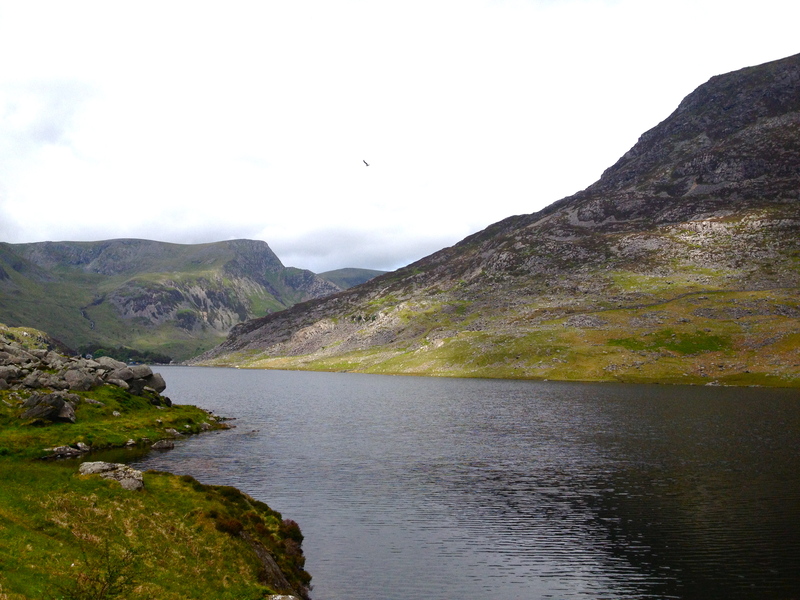 that I stop for a photo at Llyn Ogwen. It’s too pretty not to. 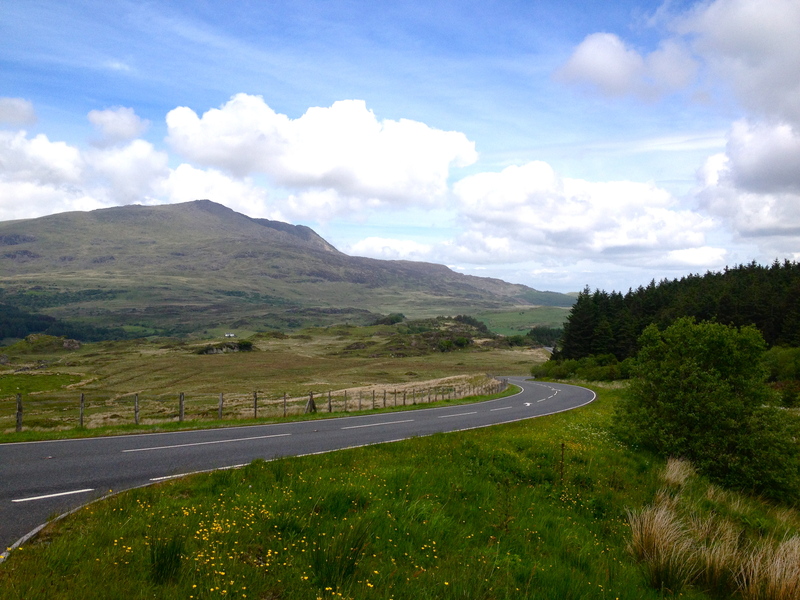 Whilst I was out on this ride, there was also a pretty major racing event taking place around Snowdonia; The Etape Eryri – The Snowdonia Sportive. Upside to this was the roads were full of cyclists and it was a really great atmosphere, at one point I was cycling down the A5 into Betws-y-coed, whilst the race was trudging uphill in the other direction which made me obnoxiously thankful ( even though I was fully aware that , to go down a hill , means at some point you WILL have to go back up). Downsides to this, I hate to say it, were that on several occasions is seemed to me that traffic assumed that ALL cyclists were travelling in that one direction, thus missing me completely and cutting me up. One traffic flow officer was actually waving a car across in front of me , and I had to shout to make her aware of my presence. By this point the car had already pulled out halfway into the road. Anyway, busy atmosphere, busy roads, all to be expected. All in valuable experience I guess. It’s safe to say as well that throughout the day I got pretty tired of doing the “Cyclist-nod” to every single cyclist who passed me. It would be rude not to, of course. So , as I mentioned earlier, Crimea Pass…. 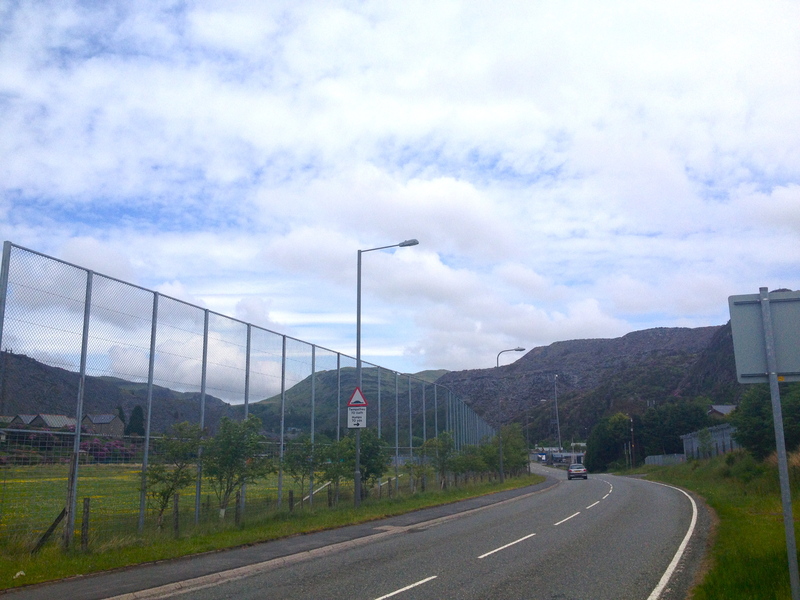 a very, very, very, long hill from Betws-y-coed up to Blaenau Ffestiniog. To say I wasn’t expecting it would be a gross understatement. I would say “you’d have thought Ryan would’ve warned me” but really, I know better. In a way I’m glad he didn’t, I think my lack of dread, and my sudden surge of fearful energy got me partially up the pass with some optimism and vigour. I then settled into what I like to call my “all day pace” and eventually reached the top. I had to stop and take a photo part-way up , but sadly the photo doesn’t really do the pass justice. ..I actually really enjoyed the whole ride. 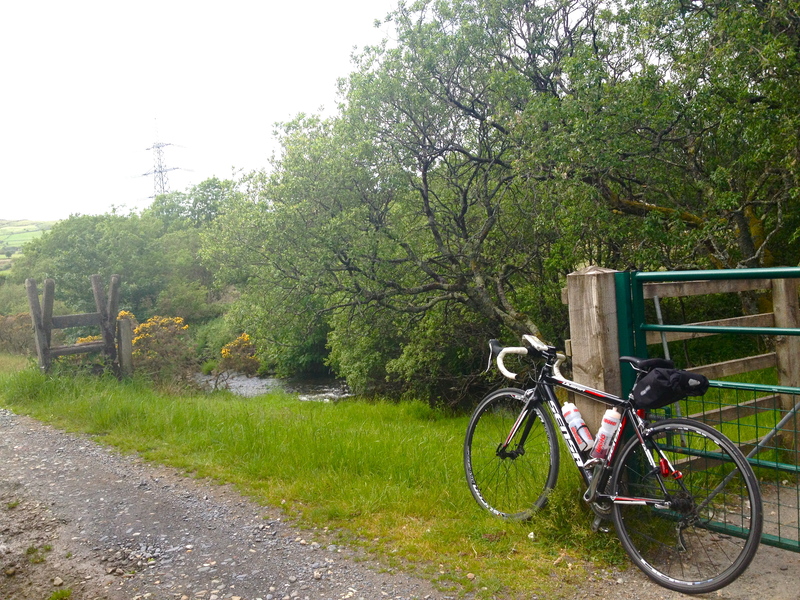 I then went on to follow A roads into Porthmadog, Tremadog and finally Dolbenmaen before joining the national cycle route that took me to Caernarfon. I had to play some music on my phone for a little while when I was on the cycle path. I found that silence ALL day just meant that I kept on either repeating or sometimes singing Welsh town names round and round in my head. “Blaenau Ffestiniog” was a popular tune of the day. 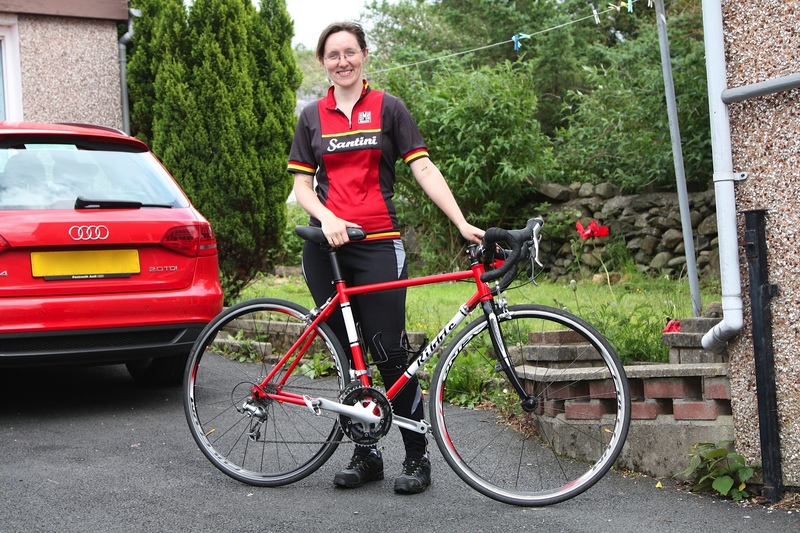 When I reached Caernarfon (and the finish line of the race that was taking place that day) a couple of people clapped as I cycled past, thinking I was taking part in the big race around Snowdonia. I smiled sheepishly and thanked them, even though I hadn’t done even half the amount of hills that the racers had done. As I was cycling through I actually managed to spot the family out on their walk. My initial thought process was “awesome, cycling done, I’ve got a lift back”….then I realised the likelihood of that being kosher. After a quick hello, a chocolate orange ice cream and a quick dose of the awesome atmosphere of the aftermath of the race at the finish line I was back on my bike for the final 11 miles of my route. The sky was cloudy, it was attempting the rain and the green fly population was rapidly increasing. I finished the day with two hills up from Tregarth towards Racub. Put every last ounce of energy into it, and ended the day pleased with what I’d done. My story concludes to this wonderful , wonderful ending. After cycling the 75 ish miles, it was ALL worth it because when I got home I had the promise of Luke’s speciality CHOCOLATE PECAN PIE waiting for me. YUM. Now that I can definitely cope with!!! So, overall, a good day, and great prep for the trip. I have Wednesday off work , so I’m planning a ride for that . Then this Saturday I’m running my 10K race for life with my friend, Lauren. Riding sunday will be interesting after the run, but it uses different muscles, so I’ll probably prefer cycling to walking anyway ! Then it’ll be the weeks rest before the Switzerland trip. It’s all coming around SO FAST! Today I didn’t get home from work until 7pm, due to covering a late shift. So instead of going on a planned outing I attached the bike to the turbo trainer and attempted to do as many sprints up hill as I could manage. I did an hour before I ran out of energy, pushing myself as hard as I could certainly builds up an appetite. With all the bother I’ve had recently with my eyes (bugs, dust and wind are not kind to eye health) I finally took the plunge and booked an appointment with the optician. Hopefully I’ll be able to get contact lenses to fit my bizarrely shaped eyes so I can wear wraparound sunglasses and stop a lot of these problems occurring. I’m also going to need to speak to them about how my eye is still hurting after getting something in it last Saturday, the appointment is on Friday after work. And now I just have to get it home some how! After work, despite the threat of rain from the ominous looking clouds, I think I might be able to squeeze in a few extra miles so I go for a little detour, I think I made it about 20 seconds down the road before the torrential rain started, so I hastily retreated and dragged my drenched self home. Once I’d dried myself off I did a bit of indoor cycling and watched the rain pour down from the warm safety of the front room. Thursday was almost a rest day, as I was working in a different part of Oxford which I decided might be quicker to drive to. In hindsight it would have been easier to cycle as I sat in a lot of traffic jams watching cyclists sail past me. 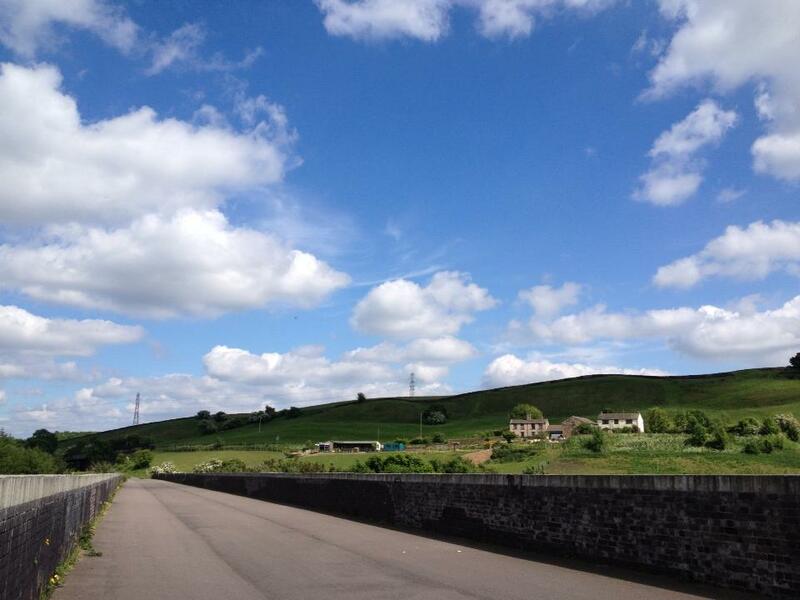 Once home I hopped on the bike and watched a few more West Wing episodes whilst climbing up some big hills. Friday was my first rest day of the week and I really needed it! After work I went to the opticians where I had my eyes tested and poked for two hours. Thankfully there was nothing still in my eye from the weekend, but I do have some very dry patches for which I was prescribed some fake tears to use for a week. Naturally they didn’t have my contact lenses in stock as I have weird shaped eyes, but they’ve ordered me some to try next week. I wont be allowed them unless the dryness has cleared up, which apparently can be caused by cycling and wearing glasses (because the wind gets forced around and in to your eyes). Hopefully I wont have any problems getting them next week! When I finally got home I went straight out in the car and drove back to work so I could go and pick the new bike frame, later that evening Ryan and I had a Skype chat so we could look at any differences between my old frame and new one to predict any problems we might have swapping them over. All looked okay so next week the new frame gets fitted. I spent a lot of time this week planning possible long cycle routes for my only day off of the week, as the weather reports got worse and worse as the week went on. The problem with covering so much distance is that you have to check the weather for several different counties. Eventually I reluctantly decided there was just no way I was going to be able to cover 100 miles this weekend. Instead I settled for heading out first thing on Saturday to get in as many miles as I could before the rain started, with an afternoon of indoor cycling. I cycled 25 miles and headed back into Oxford before realising that the weather still looked okay so I should stay out a bit longer. I cycled through town, taking a brief stop to get another damn bug out of my eye. Heading back home I really started to wonder if this promised rain was going to arrive as the weather looked good, but I knew that if I’d headed out on a longer ride I ran the risk of being 50 miles from home and making very slow progress in the rain. I was just cycling up to the driveway and wishing I’d done a more even number then the 36 I’d managed when a thought occurred to me….I didn’t take my house key out with me. I gave the door a quick knock just in case but I knew no one was in. I got back on the bike and cycled back into town where Christine was at work and got the very lovely building porter to watch my bike while I ran inside to frighten the library users with my lycra and beg for a house key. Back home I’d managed to add another 6 miles to my total to make it a nice round 40 miles for the day. I grabbed some lunch and had a quick chat with Ryan who was at home nursing a bad back, when the dark clouds descended and the rain started. Happy to be indoors where I don’t need to do makeshift windscreen wipers on my glasses, I tried to spend as much of the afternoon on the turbo trainer as possible. I honestly don’t know how Ryan manages to do so many hours indoors, I got bored after two hours but managed to push it to three before my brain started to melt and I had to give up. Still, three indoors is worth double outdoors so I think I did okay. Episodes of The West Wing watched this week: Can’t remember, but I had to change the disk three times! On Sunday I decided to give myself a total rest day. I had to work so instead of cycling I drove in, in fact, I didn’t go near my bike all day! It was a very odd experience, and one I’m not too keen to repeat. I attempted to do some more route mapping today and managed a bit more in my break at work, but I really need to finalise it next week, it’s a lot harder than it seems as I have to check all the roads to make sure they’re cyclable as well as trying not to make it so complicated we can’t remember the way, or too long that we wont make it in the four days we have to cycle through the UK. Today I also purchased some after-cycling recovery drink which I have had some samples of and it works really well to give you a much-needed boost at the end of the day. I also purchased some new cycling shoes, as my current ones are big and bulky and likely to make my feet too warm in the no doubt glorious weather we’re going to have for two weeks. Last night I noticed an old message I’d written about a cycling holiday we did to Scotland last summer. I’d written “cycled 34 miles today, totally exhausted”. I would now like to apologise to Ryan and Dave for being so incredibly slow and distance-averse on that holiday! It’s amazing to see something like that because it reminds me how far I’ve come, 34 miles? I could do that before lunch and still have the energy to come back again! 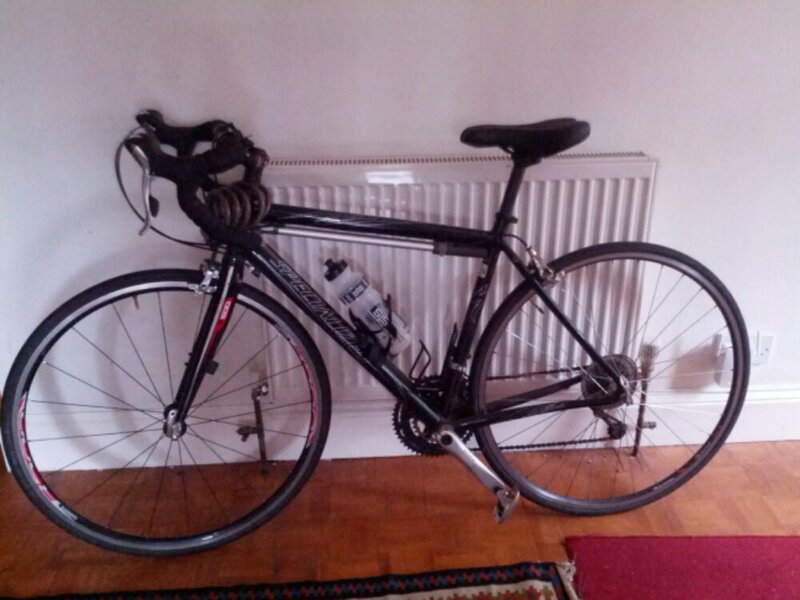 I have my bike back! For now at least. After spending yesterday evening fitting the replacement headset, brake pads and giving the rest of the bike a bit of TLC this evening was good for a quick ride to blow out the cobwebs. 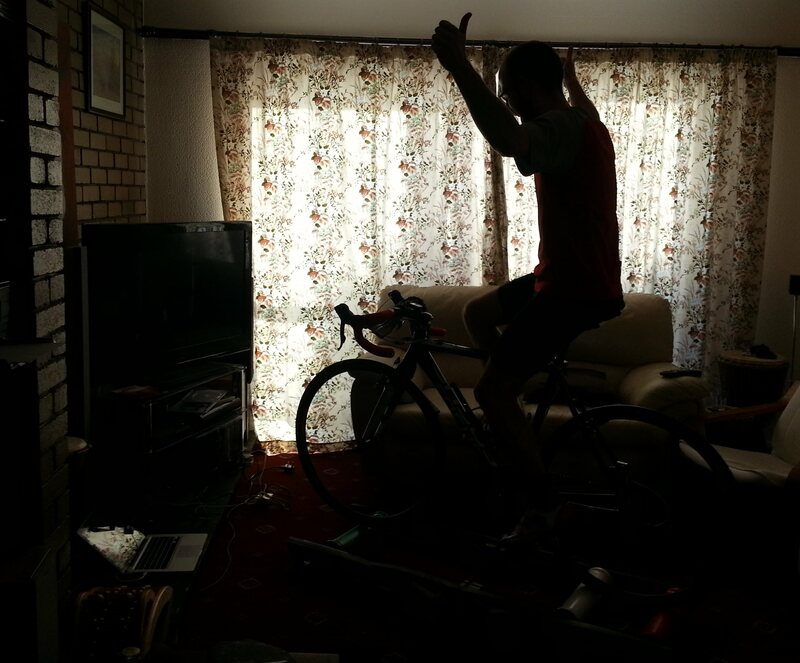 With the rain and wind tearing at my motivation I gave in and had a two hour session on the rollers instead. This evenings in-flight entertainment was Serenity, and I’m quickly working my way through unseen actiony fodder to help burn the hours away. The rollers are great because they build up balance and core control as well as working your legs, and they take a hell of a lot more concentration. It’s not that rollers aren’t fun (they’re not), but sitting in the same place quickly loses its edge. To keep interested I need to set little challenges along the way. Today’s challenge was to become able to look sideways without falling off, and after a couple of unsuccessful attempts trying to talk to Konrad I managed it a whole minute each way. I’m pretty impressed that Konrad didn’t fire pencils at me continuously! For five bonus points I managed a whole 30 seconds with no hands. 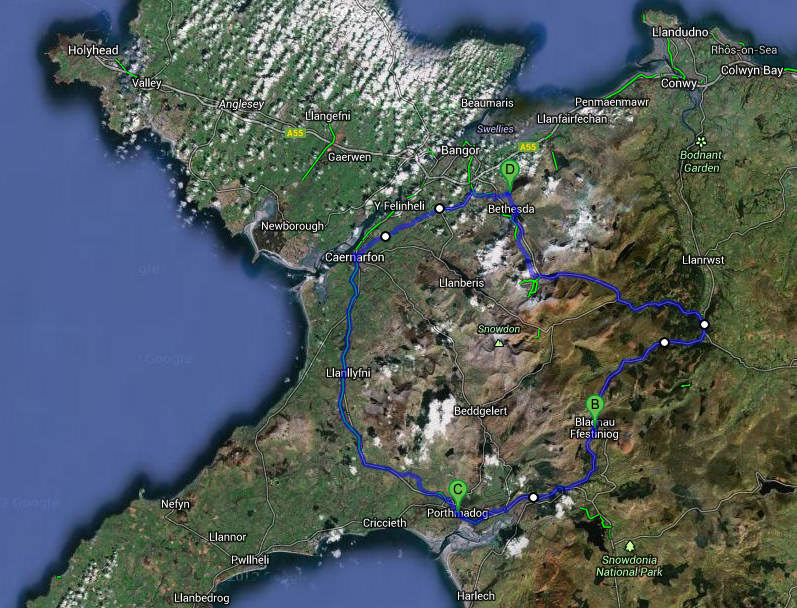 Our forthcoming cycling adventure to Switzerland from North Wales is almost upon us. It has fallen to me, as the geekiest of the group, to sort out anything technology-related for the trip, and this week’s task is to get an Internet connection sorted so we can blog progress updates at the end of the day. Some campsites will have WiFi, which eases the problem. Some will only have mobile internet and some will have neither. Aside from the usual hardening of the laptop connected to the wireless network there’s not a great deal to be done for the first or last options. There are a few sites, for example http://prepaidwithdata.wikia.com/wiki/Prepaid_SIM_with_data which lists the various options available for mobile data in your target country. The best offer at present appears to be £50 (plus a £10 set-up fee) for 3Gb of data, which is valid for 30 days. This is still quite an investment, and I’m not convinced that we will need that much data given the use of WiFi when it’s available. This offer also isn’t valid for smartphones, so you need a mobile internet dongle at extra cost. With that in mind we’ve decided to use EE’s roaming data add-on which provides 200Mb for £30. I can then use my iPhone as an access point so we can use the Macbook Pro to author blog posts. 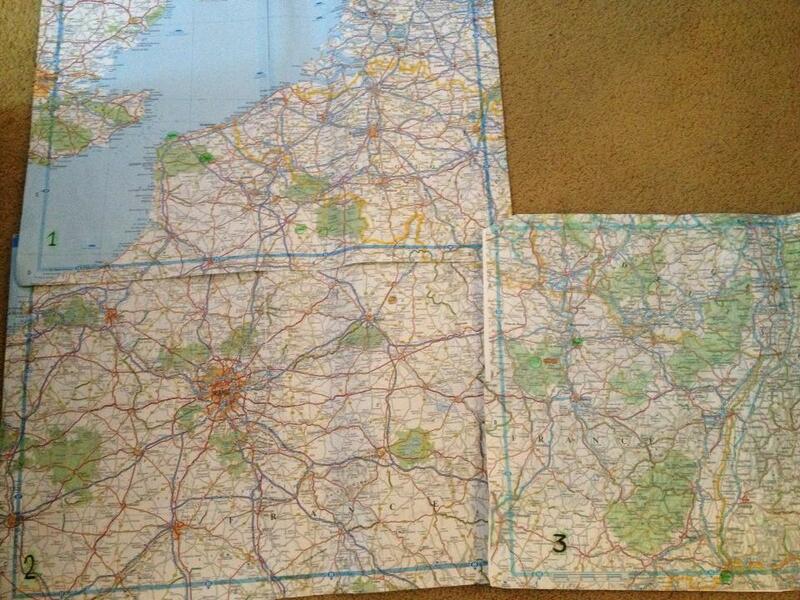 Offline maps. We’ve downloaded the map tiles for the route from OpenFietsMap (http://www.openfietsmap.nl/) which provides bike-specific OpenStreetMap maps for download. These are loaded into Garmin Basecamp, which is a bit cumbersome but means we can do map routing and elevation profiles without using data. Image resizer. I normally use Pixelmator to resize images, but Mac OSX has a handy workflow utility which means you can automatically resize/resample photos. When you’re on WiFi uploading a 4Mb image isn’t a problem, but for our daily progress reports a 200Kb image is more appropriate. Once we’re back to WiFi we can put some higher-resolution images up. Video re-encoder. We’ll probably upload videos only when we’ve got a WiFi connection, but just in case there’s something we really want to share I’ve figured out how to use Camtasia to resize and reencode the video so it looks good but is small enough not to use the entire bandwith allowance. One of the biggest problems when you’re concerned about going over a data allowance is that when you connect a laptop to the Internet it goes off and checks for updates, lets Apple know that iTunes is there, and so on. I have a handy tool installed on my Macbook Pro called Little Snitch, which acts as a firewall and keeps an eye on all your outgoing Internet connections. Normally we think of firewalls as protecting what comes in to the computer, but to make sure every last bit of data is saved I’ve created a special profile which doesn’t allow any outgoing connections except for mDNSResponder (otherwise DNS doesn’t work) and Chrome. When that profile’s active nothing except Chrome is connected to the network, so I’m not going to automatically start doing a backup of my entire machine in the middle of a campsite in France. Winner. Only allowing network traffic from Chrome in your firewall keeps your usage down. 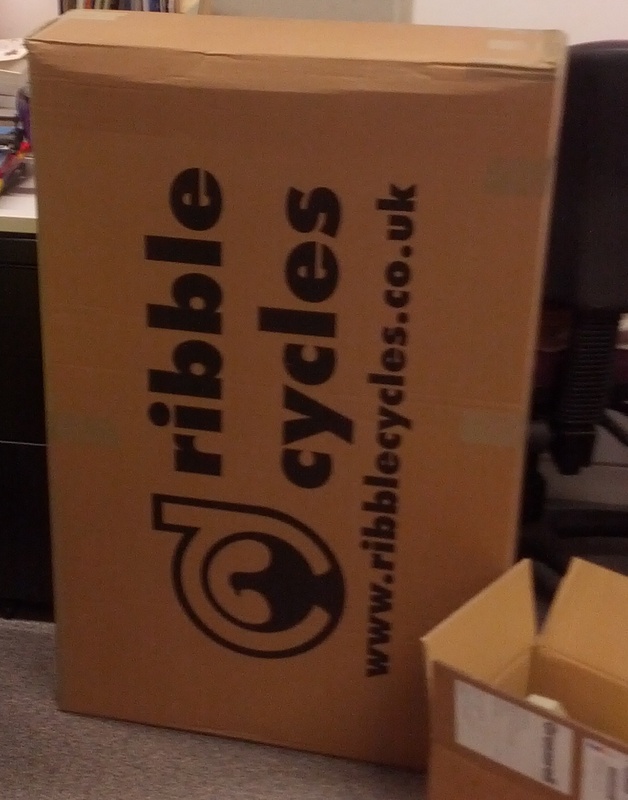 In other news my components turned up today so the bike is back together, just in time for a good bout of rain. Fortunately I have rollers! 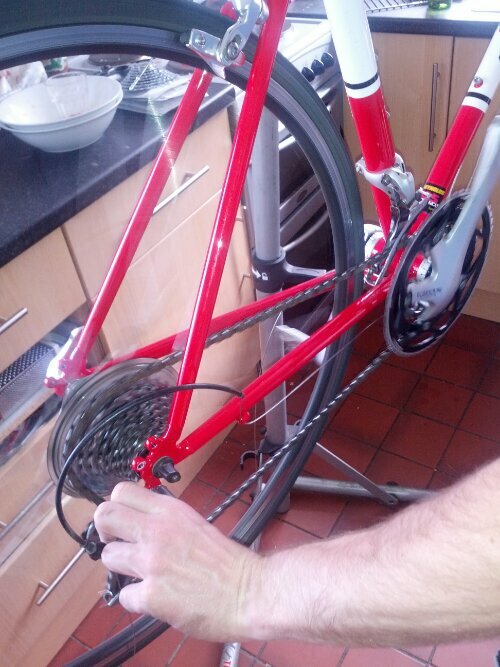 While I was reassembling the bike I gave the forks a good test, pushing and pulling them against the frame. Although everything was flush and tight, and there was no play to be felt, I could make out the sound of grease moving ever so slightly. I’m not feeling confident! 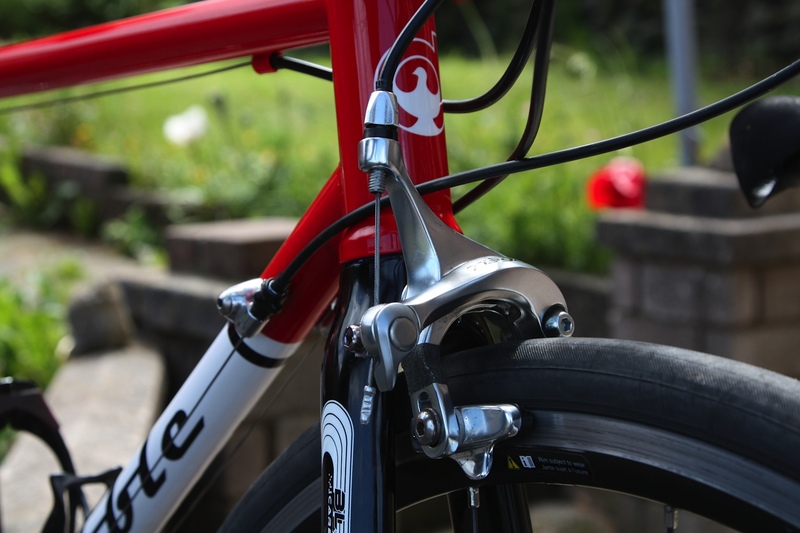 If the new stem and headset, and full strip-down doesn’t fix it I’m giving up and taking it to a local bike shop. At the weekend I managed to get out for a ride on both days. 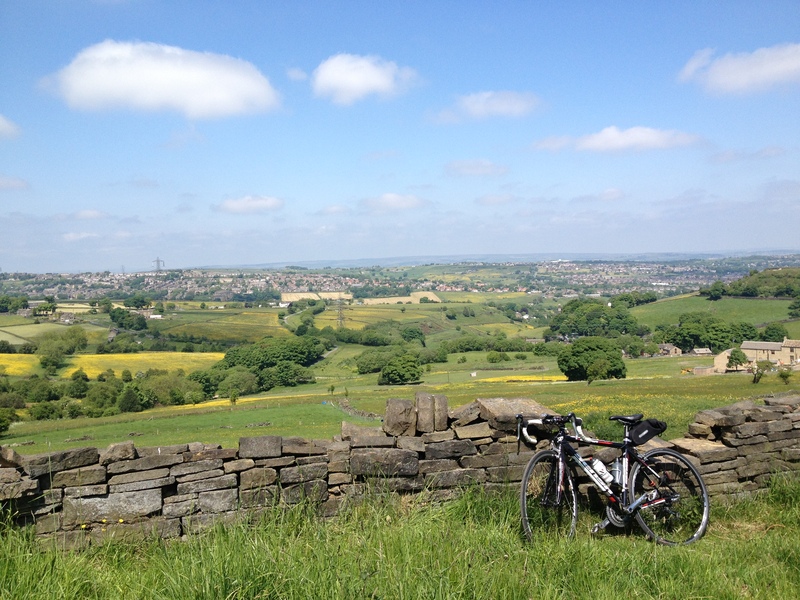 On Saturday I set out at about 1pm with the aim to go to Huddersfield and back. 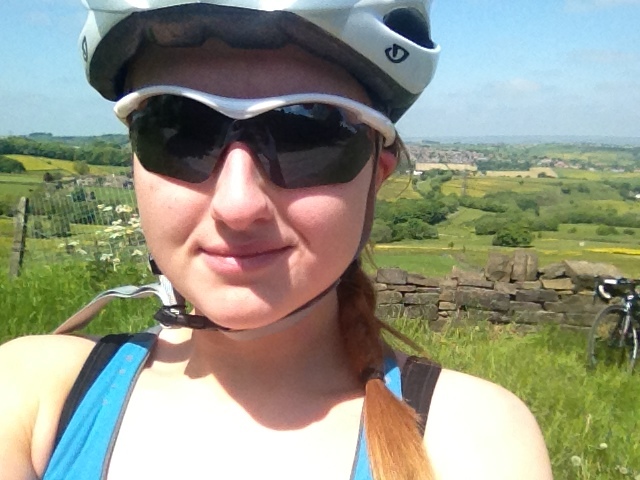 Using the national cycle routes, I made my way down towards Mirfield and then onto Huddersfield. 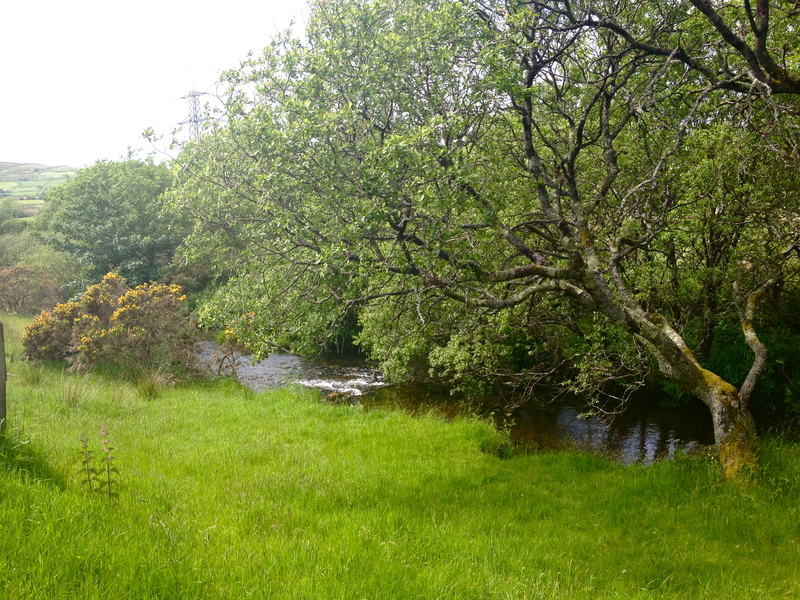 The weather was lovely but one downside has to be the sheer amount of greenflies in the air. 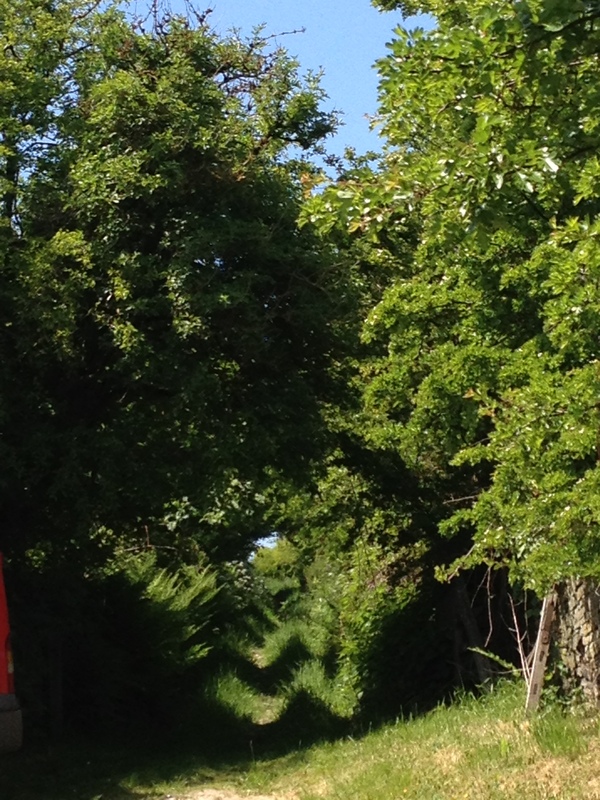 Cycling on green, thick wooded routes means clouds and clouds of them….so high speeds are difficult when it is imperative that you keep your mouth closed! I dread to think how many I ate / squished / inhaled. Despite the creepy crawlies I maintained a good average speed of about 12 and completed the 25 mile roundtrip in 2 and a half hours, stopping for a little snack here and there. 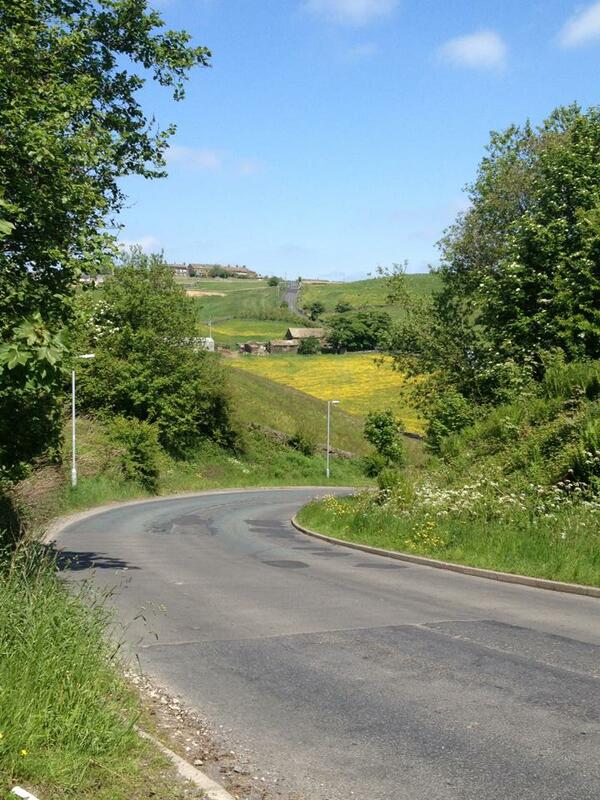 On Sunday I did a longer ride, setting off at about 12pm I headed out towards Haworth. I have fond memories of a primary school residential to Haworth, and thought it would be a nice destination for lunch. The round trip would be 40 miles, to Haworth and back. The route was fantastic. I cycled through a couple of lovely parks with cycle paths in great condition, some grim A-roads in horrific condition and some extremely fast main roads with maniac drivers trying to cosy up to me. 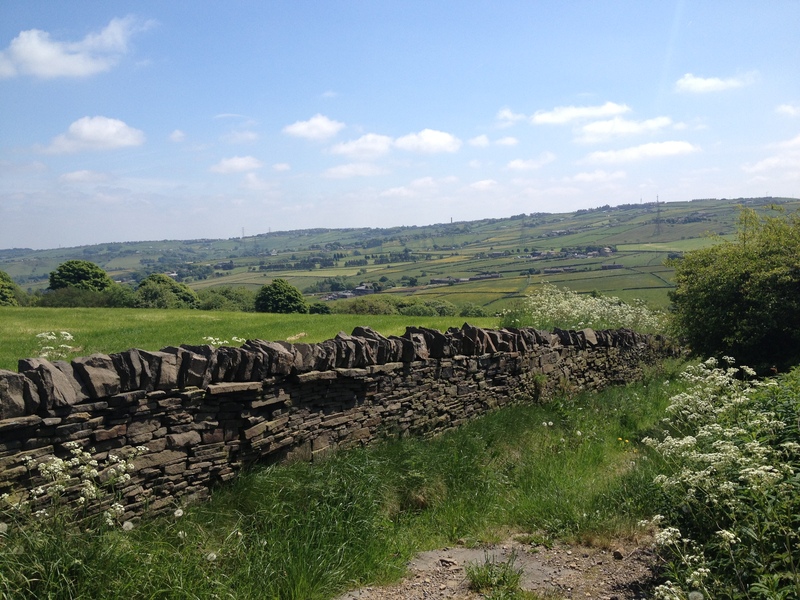 The first leg of the ride was out towards Thornton, near Bradford and it is without a doubt the prettiest place I have ever cycled through in West Yorkshire. Rolling green hills and endless fields with horses in, the roads were great to cycle on and navigate through. At one point the beauty of the place was however too much, as I had to walk my bike through Thornton’s very own “secret garden”. At one point I had to stop at take a photo of the hill I was about to climb. When I reached the top, the descent actually had a (albeit small) hairpin bend. Although it took me by surprise, I did manage to stay on my bike and keep to my side of the road. About 5 minutes away from Haworth I reached a T-junction onto the A629 and turned left, thinking “yes, turn left here and I’ll be in Haworth in no longer than 5 minutes”. 15 minutes, a 34 mph descent and two towns later I thought “I should really stop and check the map,because I should really be in Haworth by now”. Turns out I should’ve turned Right, not left, and I was now in fact in Halifax not Haworth. Change of plan. After checking the map and finding a route back home again, I finally ate some food. Having missed my Haworth target, I was seriously peckish and needed some energy. The next few roads were horrible in and around Halifax. Cobbled, narrow, steep roads that were difficult to navigate and impossible to cycle down. 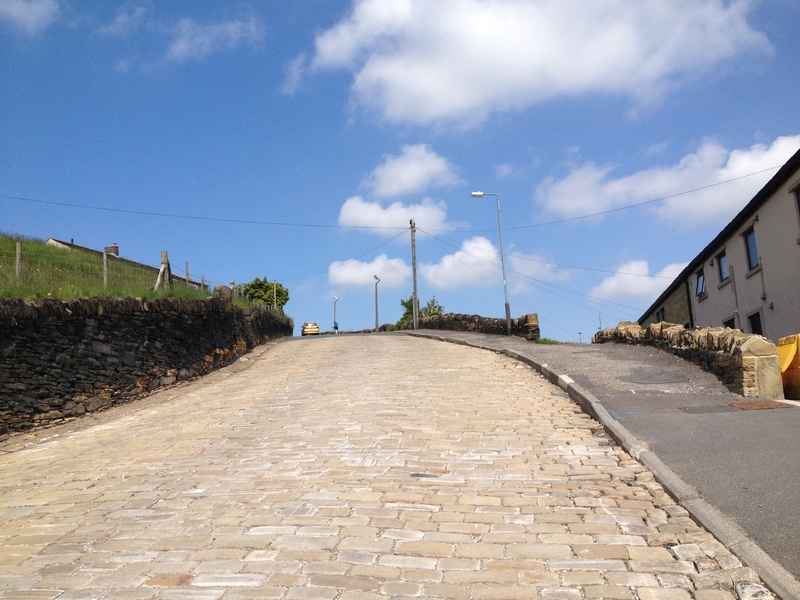 I had a wonderful welcome to one particular cobbled hill. Upon turning into the street another cyclist was exiting as I was entering. I said a friendly “Alright there” and smiled optimistically, to which he just replied: “you won’t be at the top of that”. I soon saw what he was referring to, the mammoth cobbled hill ahead of me. The hill was so mean, my legs actually came to a stop and I only just unclipped in time. Thankfully, I wasn’t the only one to admit defeat; I had to take a cheeky snap of the cyclist further on infront of me walking his bike up the hill too. So a few steep climbs later I emerged on another a-road that would take me back home. 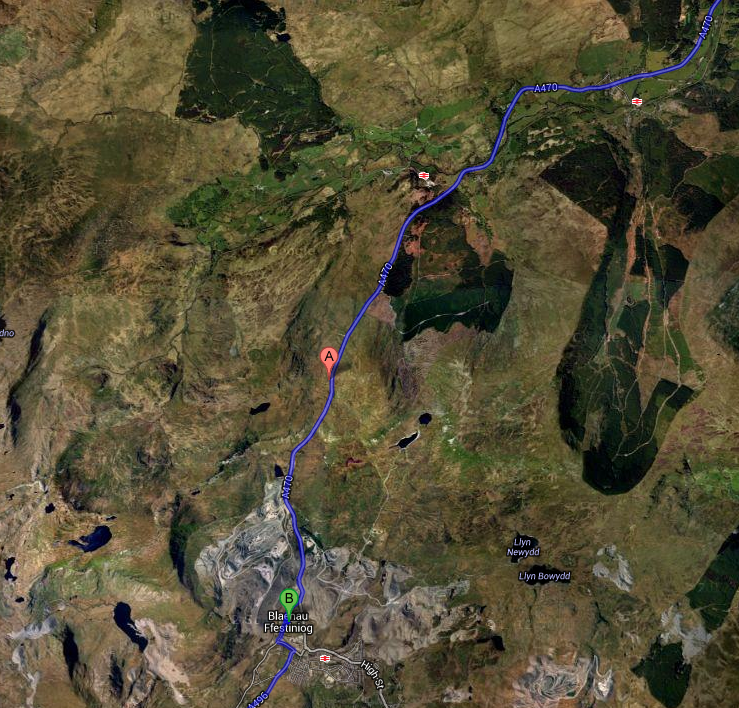 Sundays route actually proved to be the most physically challenging route I have ever done by myself. The uphill climbs were really hard going and maintaining a good speed downhill helped build up my confidence. A pretty good training weekend overall. Kerry came over for the weekend too, so being out for rides meant I didn’t get to spend that much time with her. However, I came home from work on Monday evening to find her and dad in the driveway painting the bike trailer for the trip!! Impressed doesn’t even cover it. 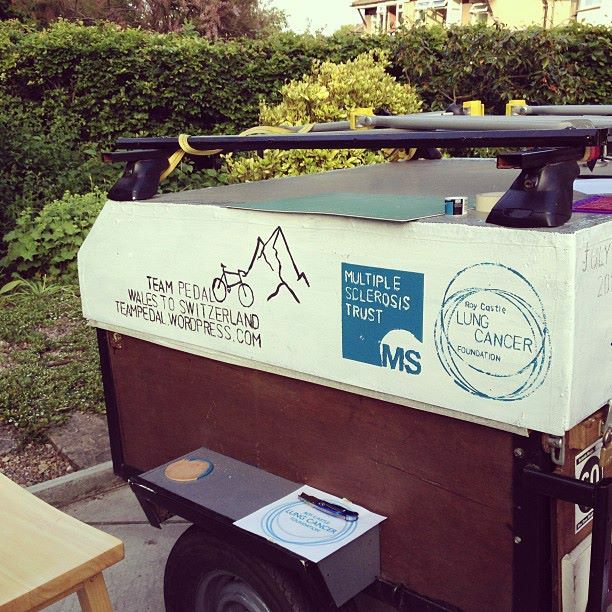 They’d stenciled on the logos of our charities and the name and website for Team Pedal. So when I got home we got the paint out and set out on finishing the trailer that evening! The finished result is pretty exciting, and the trip feels very very real now, and soon. 3 and a half weeks to go ! Me and Dad are responsible for the Calais – Basel section of the expedition so that evening we got cracking on mapping routes through France, and the overall route is coming along nicely ! I was planning on going to Wales this Sunday, driving down Saturday night after work, to fit in a last 100 mile ride before our trip. However, It turns out I have to work Sunday and there’s no way of covering it … so I’m pretty disappointed. This also means that I only have one day off this week, so Thursday will have to be VERY productive.